When you have less to work with, you make what you have count. This is often the case when we encounter small cellars that are just getting started out and they want to let people know about their wines. If you can’t tap Frank Gehry to design your winery then you have to get more creative such as hosting a wine tasting in the vineyards. Yeah, it might seem like a cheesy setting for a brochure shoot but despite experiencing it several times, it is admittedly effective. One of our more memorable visit was in Sopron, Hungary with the Pfeiszl sisters, but a recent one with Clos 93 was up there. They’re a new winery in the DOQ Priorat (in fact, they’re #93 in the total 98 that exist, hence the name) and, while based in El Lloar, they make their wine at another cellar so they have a bit of a floating situation. 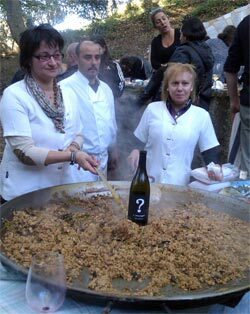 We encountered them and their wine at the Torroja harvest festival and were curious to see and hear more. So, they invited us down to their vineyards at the base of the Montsant mountain range, just where the soil shifts from slate to clay. We arrived at El Lloar and Pepo met us in town. As timing would have it, some redfaced fellow in a BMW SUV showed up then as well and was invited along. As we started on the initial 100 meters up to the vineyards, it seems that the fact this guy broke a sweat closing his car door was telling of things to come and ditched us. We gradually wound our way up the hills, passing alongside the sharp terraces that Torres Priorat cut in to the hills and then we came up to Clos 93’s vineyards that were cast about the hills in surprisingly tight rows given the initially steepness to reach them. 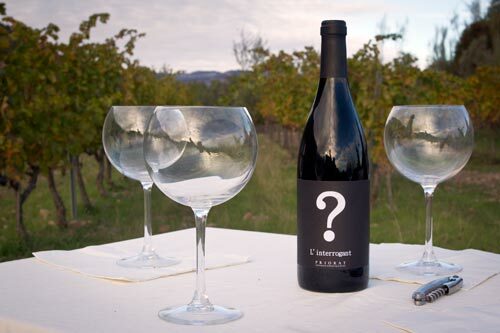 And there, at the top of it was the table you see above with a bottle of l’Interrogant (the Catalan word for the question mark) set upon it. But, we weren’t to drink just yet and so we were led further up in to the red cliffs of the area to take in one of the many breathtaking scenes we’ve been privy to while staying in Priorat to work on our guide. But, it was quickly getting dark and threatening to rain, so we walked back down and found Mar Galván had joined the group just in time for a glass of wine. A few sips and laughs mixed with a sky that was ever darkening and we eventually all head back down from the vineyards.